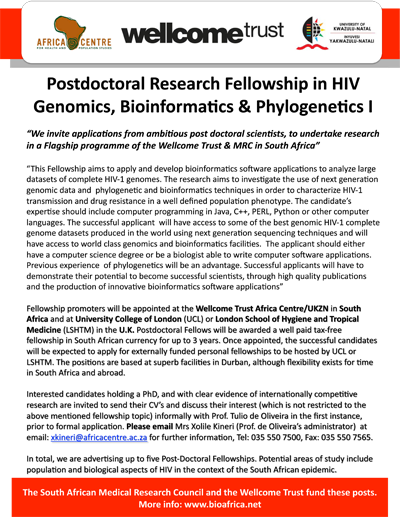 We invite applications from ambitious post doctoral scientists, to undertake research in a Flagship programme of the Wellcome Trust & MRC in South Africa.This Fellowship aims to apply and develop bioinformatics software applications to analyze large datasets of complete HIV-1 genomes. This Fellowship aims to apply and develop bioinformatics software applications to analyze large datasets of complete HIV-1 genomes. The research aims to investigate the use of next generation genomic data and phylogenetic and bioinformatics techniques in order to characterize HIV-1 transmission and drug resistance in a well defined population phenotype. The candidate's expertise should include computer programming in Java, C++, PERL, Python or other computer languages. Fellowship promoters will be appointed at the Wellcome Trust Africa Centre/UKZN in South Africa and at University College of London (UCL) or London School of Hygiene and Tropical Medicine (LSHTM) in the U.K. Postdoctoral Fellows will be awarded a well paid tax-free fellowship in South African currency for up to 3 years. Once appointed, the successful candidates will be expected to apply for externally funded personal fellowships to be hosted by UCL or LSHTM. The positions are based at superb facilities in Durban, although flexibility exists for time in South Africa and abroad. Interested candidates holding a PhD, and with clear evidence of internationally competitive research are invited to send their CV's and discuss their interest (which is not restricted to the above mentioned fellowship topic) informally with Prof. Tulio de Oliveira in the first instance, prior to formal application. Please email Mrs Xolile Kineri (Prof. de Oliveira's administrator) at email: xkineri@africacentre.ac.za for further information, Tel: 035 550 7500, Fax: 035 550 7565.